We are delighted to report the results of the 2013 IEB November Examinations, which were released to the school yesterday. The Class of 2013 have delivered a wonderful set of results, once again establishing Kearsney as the top independent boys’ school in South Africa for academics. Congratulations to the boys on these wonderful results. Through their hard work and discipline throughout the year they have made themselves, their families and their school proud. We are incredibly proud to have SIX pupils make the IEB’s Outstanding Achievement and Commendable Achievement lists, which encompass South Africa’s top 136 candidates, or the top 1.3% of all IEB pupils. Kearsney College is THE ONLY independent boys’ school in the entire country to achieve this feat. The IEB’s Outstanding Achievement and Commendable Achievement lists can be viewed on our website via this link. Kearsney’s excellence in Mathematics and Physical Sciences was reaffirmed, with an incredible 44% of those who wrote Mathematics and 42% of those who wrote Physical Sciences achieving a distinction. We are also incredibly proud of the achievement of our boys in Advanced Programme Mathematics, which is equivalent to A-levels in the UK. Almost a quarter of the 34 candidates who wrote the exam achieved distinctions, whilst 59% of the candidates achieved an A, B or C. Given the importance of this subject to fields such as Engineering and Medicine, this is an area that we have been focusing on and it is wonderful to see the fruits of this labour. Kearsney is incredibly proud of our Maths and Science Excellence Programme and the wonderful results that we consistently achieve in these subjects. for Accounting, 4 in the top 29 for History and 5 in the country’s top 6 EGD candidates. 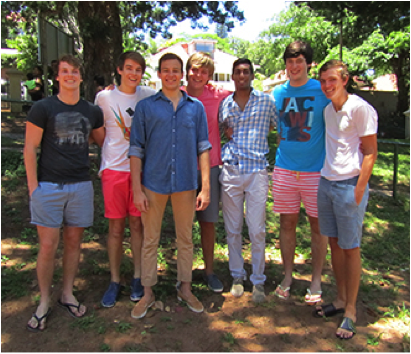 The 129 Kearsney boys who wrote Matric achieved an impressive 299 distinctions between them – an average of 2.3 distinctions each. One boy achieved ten distinctions, four boys achieved nine distinctions, six boys achieved eight distinctions, six boys achieved seven distinctions apiece and altogether thirty-two boys (a quarter of our matrics) achieved four or more distinctions. Pictured left: 60 distinctions between them: Vaughn Pears (7); Edwin Bunge (9); Daniel Kolev (10); Greg Royston (9); Samuel Hansen (9); David Clarke (8) and Josh Bean (8). A 100% pass rate and 95% Bachelor Degree (University Exemption) pass rate was achieved by the Class of 2013. We are delighted that the excellence that we have collectively strived for extends to all the subjects that we offer, with wonderful achievements being recorded across the board. Academics are Kearsney’s number one priority and Kearsney boys are immersed in an academically rigorous environment from day one. The boys are inspired to achieve academically and they quickly adopt a wonderfully positive work ethic during their time at the College. This environment of academic striving, together with our highly qualified and incredibly professional and dedicated teachers, in a disciplined environment, empowers the boys to reach their potential and we acknowledge the important role that so many play in making this possible. (achieved a ranking within the top 5% of all IEB students in 6 or more subjects and at least 80% for L.O) Top 1% in subject within the IEB shown in bold. These fantastic academic results round off a great year for Kearsney College. We congratulate the Class of 2013, their parents and their teachers for once again putting Kearsney out in front of all the other boys’ schools in KZN and South Africa.